NUMBER ON UNDERNEATH OF BIN 622147. This door bin will not fit any other fridges. Please check the number on the old bin in your fridge.. 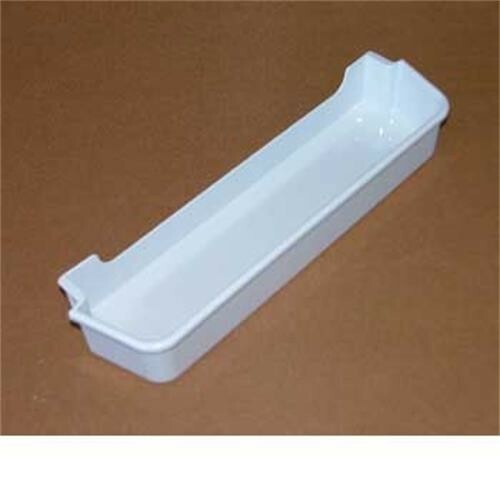 Deep Door Bin for Thetford N90, N100 N104 & N108 Fridges. White plastic. Length 420mm, width 110mm. Flat fronted door. Thetford part number 624024. Fits a treat. The old one was not strong enough to carry a bottle of pressecco!! The deep door bin on our Thetford Fridge had split down the side and across the bottom. Although our caravan is now 13 years old this replacement fits the N90 fridge perfectly. Item required as replacement for broken original. The deep door bin arrived promptly and well packaged. Great to find a site that gives enough information to buy the correct part first time. Perfect part .Its a good job its available otherwise we had nowhere to store our milk bottles etc. Excellent product that fits perfectly. Replaced broken shelf but previous attempts ended in finding replacements that were too expensive to warrant buying them. Good price and delivered quickly. I guess the design means I will be buying another soon however as the Thetford door deep bin design is far too flimsy to last very long. I was dismayed when the bin on my 8 year old fridge broke, and am delighted that I was able to find the replacement her. Very pleased with new door bin made fridge look like new, service excellent very fast delivery. Door shelves for Thetford fridge arrived very well packed and I was kept well informed when they were to be dispatched and when they would be delivered. Would certainly use again. The fridge bin I ordered was delivered on time, it fits in fridge as expected, but have not done a test run yet, so at this time I am very satisfied. Easy to order with quite delivery, part was perfect and was to replace broken part. I have been trying to find this part for months. It was easy to order, with all the details I needed before ordering to make sure it was the right part. Came very quickly and very reasonably priced. Very Happy. I bought the new shelf to replace a broken one. Liked the ease of ordering and arrived well packed. I will definitely be using this site again in the near future. I need a part for the warm air ducting for my Coachman Pastiche. I needed this to replace a broken one in my Bailey caravan. The website was easy to navigate & very easy to understand. The item was ordered on Tuesday & arrived on Thursday. Terrific service Leisureshop, I wish all internet shopping was so easy!! I will be back in future. Needed this item for second hand caravan and a few bits needed replacing in the fridge - excellent service and delivery, now it's as good as new! Having bought a second hand caravan I found that the deep door shelf was missing. Leisureshop not only had the part easily available at best price but delivery was very fast on standard delivery and well packaged. Fridge now at full spec.